This is an update version of HC-05. 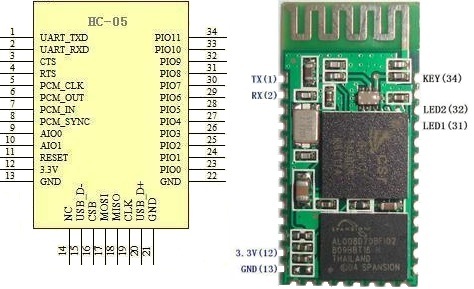 HC-05 is a SPP (Serial Port Protocol) Bluetooth, can be set as master or slave. With the castellated half-cut holes, you can easily embed it in your project. HC-05 is made by a experienced Bluetooth design and manufacturer supplier in China, it has been tested very well, and mass production for big quantity, widely used in many Bluetooth project. PIO8 is used to control LED indicating the status. It will blink after power on. PIO11 is used to set the two mode: AT command mode (if the pin is connected to 3.3V) or Automatic binding transparent data mode (if the pin is connected to GND). 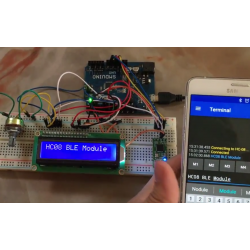 The AT command mode is used to configure some characteristics of the device (for example the Master, Slave or Loopback mode).